We are taking the concept of sustainable power past the current wind and water concepts and into new areas of discovery. From earth’s generated heat to converting our never ending piles of garbage and trash into energy, we are searching and finding ways to stop the cycle of pollution on the earth for our needs. 1. Wind. This is probably the most promising of all sustainable energy sources. There is a lot of potential in wind energy. Currently wind power is responsible for producing about 20 percent of Denmark’s electricity, and about 7 percent of Germany’s electricity – the country that has the largest market in the world for wind power. However, there are some disadvantages to wind power as well. Of course, it is necessary to put the wind turbines in very windy places, otherwise they will not be effective. This means they would simply not work in certain areas of the world. 2. Geothermal Power. Under the earth’s crust there is a great amount of heat, and it is possible to generate electricity using this heat. This process is clean, and it requires the water to be heated into steam, which is then used for heat and electricity generation. Geothermal plants can work all day and night and they are environmentally friendly, so this is a source of sustainable power. However, geothermal energy is only available is some parts of the world, like the U.S., East Africa, Central America, and the Philippines. 3. Municipal Waste to Energy Programs. This is also very promising sustainable energy source. Waste to energy programs basically take household garbage that we discard and turn it into sustainable power, which comes back to us in the form of electricity for our homes and businesses. The best thing about them is that as we are cleaning up our overfilled landfills, we are creating electricity at the same time! 4. Tidal Power. This is another type of sustainable power, because the tides in the ocean are very powerful. Their energy can be captured and then converted to electricity. This renewable energy source is completely clean and it does not contribute to global warming. 5. Solar Power. This is one of the most powerful sustainable energy sources. If we were able to capture and use all of the sunlight we get in just one day, we could supply the entire earth with energy for one year! It is also completely clean, with no pollution or damage to the environment involved. 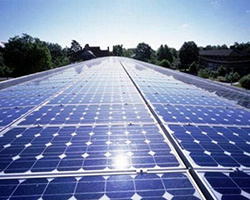 Solar power can be generated through panels that can be installed on the roof of almost any structure. They can also be used for domestic purposes, like heating your home. It is also possible to use solar power as a solution for industrial heating or for cooling equipment. 6. Biomass. In this source of sustainable power, plants like corn are converted into ethanol. The ethanol is then burned by power plants and this generates power. Ethanol can be added to gasoline, which decreases foreign oil dependence. However, there have been some complaints from developing countries about using food crops that could be eaten for converting to ethanol, so this energy source is far from perfect. 7. Wave Power. There can be incredible amounts of energy derived from waves, especially when a storm hits. Of course, this is also the major drawback of this sustainable energy source, because the equipment used for this method has to be strong enough to survive the weather conditions necessary to generate wave power, and has to be able to withstand the corrosive forces of the sea. Posted on January 5th under Expert Advice, Renewable Energy Sources. Yes – wind energy is very feasible upto about 20% of total energy produced, and yes again to off-shore energy farms – where the future of wind energy lies. This is a great technology, WAY better than solar for instance, which is ineffecient and generally a bad move. But you have the problem of energy storage. If parts of Europe are relying heavily on wind farms, what happens when the wind stops? Blackouts! For this reason, with energy storage technology extremely limited, wind energy will never really take off.